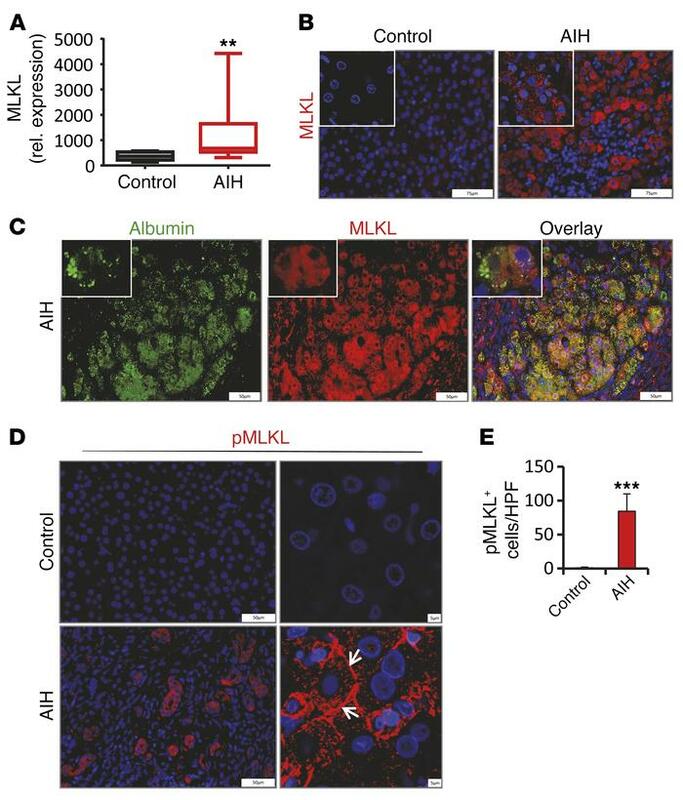 MLKL is upregulated in areas of severe inflammation and cell death during AIH. (A) Quantification of hepatic MLKL mRNA in liver biopsies obtained from control (n = 10) or AIH patients (n = 10). **P < 0.01 by paired Student’s t test. (B) Representative images of liver tissue paraffin sections analyzed for the presence of MLKL by immunofluorescence staining. (C) Representative images showing double immunofluorescence staining of MLKL and albumin in tissue paraffin sections of AIH liver. Inset magnification: ×3.38 (D) Representative images of pMLKL-stained sections of control or AIH liver (arrows demonstrate subcellular MLKL localization to plasma membranes; images on the right are confocal images) and (E) quantification of pMLKL-positive hepatocytes (n = 10 per group). ***P < 0.001 by paired Student’s t test. Error bars indicate ± SD, gene expression levels are shown relative to HPRT. Scale bar: 5 μm (D, right); 50 μm (C and D, left); 75 μm (B); 2.77 μm (B, inset).